Viscero-somatic referral (Viscero= organ, Somatic=relating to the body): In this case your brain misreads a distress signal, so an organ problem feels like a muscular problem. The most famous example is the heart attack that creates an aching arm or jaw, or bone cancer masquerading as a back strain. Pain that doesn’t respond to treatment needs to be assessed by a medical professional to rule out dangerous causes. Chronic spasticity: Healthy muscles are constantly changing their level of tension. They work with constant feedback from the cerebellum (part of the brain) to make tiny adjustments. This is how we keep our balance and perform tasks smoothly. When a muscle is tight for a long period of time, however, its setpoint changes. It thinks being tight is normal – this is called spasticity. It leads to stiffness, pain, and misalignment of bones as they are pulled out of place. Blood flow is blocked, creating painful ischemia. Tight muscles and misaligned bones can pinch nerves causing “electric shocks,” tingling, or numbness. This is what I see most often when people come in with unexplained pain. There’s nothing to show up on an X-ray or MRI, because the problem is functional, not structural. Massage is a great temporary relief, but to really fix it you need to treat the cause of the problem, the neurological setpoint. Acupuncture and Osteopathic-type medical massage remind the nerve controlling the muscle how it’s supposed to behave. Once the muscle relaxes, bones return easily to their proper place, and the body can heal itself. Fascial adhesions: Each muscle fiber has connective tissue, called fascia, surrounding it like a layer of Saran wrap. It may help to picture a muscle fiber as a drinking straw in a paper wrapper (sheath of fascial connective tissue). At each end, that fascia becomes our tendons. These sheaths are supposed to slide past each other as muscles move. With long periods of no movement, if the muscles are spastic, or if there’s an injury, they can stick together and form a fascial adhesion. When your muscles are shrink-wrapped together, it can cause muscle stiffness and unexplained pain. Some people like to get in and dig the adhesions apart, deep-tissue massage style. That works well in the short term, but it also causes inflammation… which causes scar tissue… so the adhesions reform. 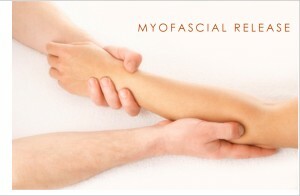 Myofascial release, a type of medical massage, uses a more subtle approach to slide the layers apart. I love doing this type of work because the result is immediate freedom of movement with no pain and no boomerang side-effects. Emotional causes of pain: Sometimes the pain of an injury lasts far longer than it logically should. This usually points to an emotional attachment. The brain literally links the muscular dysfunction with the memory, and the unresolved post-traumatic stress around the incident will actually prevent the body from completely healing. This can happen with gradual, cumulative injuries too: Imagine a tight neck from a job you hate. Patients will frequently have an emotional release when we start working on the physical site. They may start crying, giggling, getting angry, or suddenly find themselves terrified “for no reason.” Once we get those remaining feelings flushed out, the muscles and tendons often recover rapidly. If you feel something emotional happening during a session, let it out! Releasing pent-up emotions is therapeutic for your body as well as your soul. Doctors used to blow off psychosomatic illnesses as “all in your head” and not worth treating. The medical community now has a better understanding of the interplay between the mind and body. It’s a two-way street, and they affect each other profoundly. Chronic pain will screw up your neurotransmitters (chemicals in your brain) and temporarily change your personality. Likewise, an overthinking, worried mind can trigger digestive troubles like IBS (Irritable Bowel Syndrome). If you have a chronic injury that isn’t healing, it’s worth reflecting for a few minutes. Is there anything your body is trying to tell you? If so, consider talking it out with a therapist or a good friend. Acupuncture can help balance your emotional life, but there may be some work needed on your part, too. Of course you’re welcome to discuss anything in our sessions, and your confidentiality is always assured. This entry was posted in Chronic illness, Most popular articles, Muscle & Joint, Pain Management and tagged acupuncture, arthritis, emotional pain, fascia, myofascial, pain, pain management, viscero-somatic by Sharon Rose. Bookmark the permalink. I really like your writing style, fantastic info , thanks for putting it up : D.
I just want to tell you that I truly savored this post. Many thanks for sharing with us. I want to say this post is fantastic.